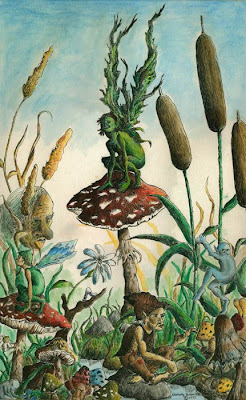 I have just been reading about pixies and discovered they are exclusive to Britan and Celtic Mythology. I found it especially interesting that they are considered to be a fairy of sorts. Pixies, elfs (as opposed to elves), brownies, and other little people I think generally fall under the category of Fairyfolk and their kin. I went back and further explored that site. Did you access all the pixie pictures? I just love this one. I think it would look cute in a child's room. Don't you? That's a cute picture, Toni! Do you remember all those little Christmas tree pixie elves that were popular in the 1960s or early 1970s? We still have some of them that end up on the tree some years. I used to think they were ugly, but they've grown on me.